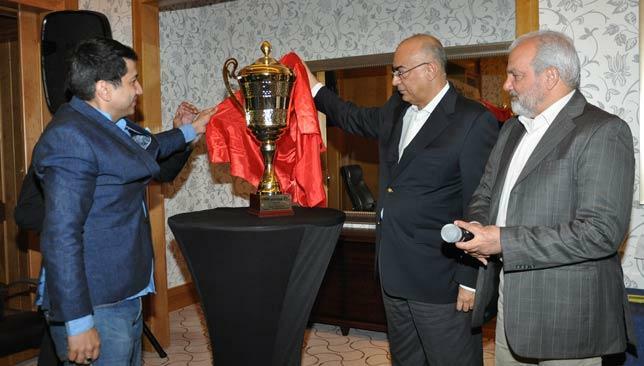 All to play for: Organisers unveil the Midcom T20 trophy. Going global: The World Cup trophy has been all over the world in the lead up to the tournament in Australia and New Zealand. The ICC Cricket World Cup 2015 trophy will be showcased in Dubai this week as part of the official launch of Victoria Week. The ICC Cricket World Cup will see a total of 49 matches hosted across 14 venues – seven in Australia and seven in New Zealand. Melbourne, the capital of the Australian state of Victoria, will play host to five matches including the final in March at the famous Melbourne Cricket Ground. Joining the Victoria Week celebrations in Dubai will be John Harnden, Chief Executive Officer of the ICC Cricket World Cup 2015 Local Organising Committee. John Butler, Victorian Commissioner to the Middle East and Africa and Turkey, said: “We are delighted to be welcoming John as part of our Victoria Week celebrations and to give people the opportunity to see the trophy at our official launch adds to the overall excitement. The UAE qualified for the World Cup earlier this year and will play their opening match against Zimbabwe on February 19 in New Zealand. Coach Aaqib Javed and his team are currently in Australia preparing for the tournament with a series of fixtures as part of the ICC's High Performance Programme for associate nations. “The ICC Cricket World Cup is one of the biggest sports events in the world and will attract a massive global audience, especially for the final in Melbourne on March 29 next year,” added Harden. Victoria Week is a week-long programme that includes a host of activities and events to promote the best Victoria has to offer the Middle East region across trade and investment, food and beverage, tourism and sport. 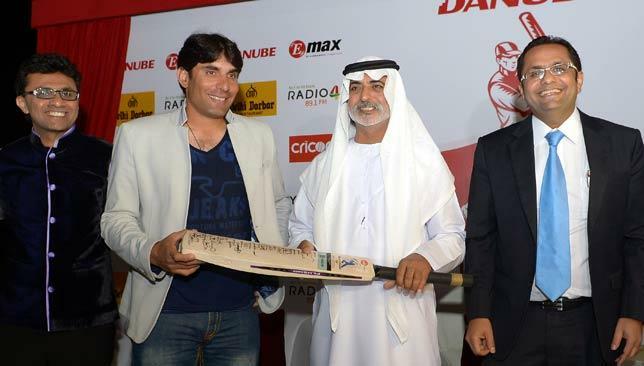 Fantastic preparation: Anis Sajan (l), Pakistan captain Misbah-ul-Haq (centre l), Sheikh Nahyan bin Mubarak Al Nahyan, Minister of Culture, Youth, and Social Development (centre r) and Rizwan Sajan (r). 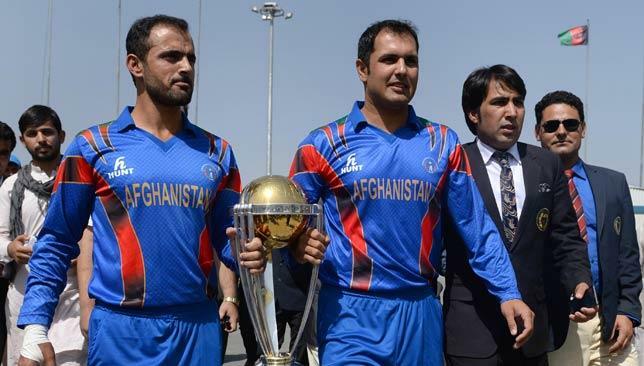 Danube Test Series chief Anis Sajan hopes the competition can help domestic cricketers to improve their mental approach to the game, saying it will be good preparation for the UAE team ahead of next year's World Cup. The second edition, to begin on December 17, will see nine 'A' Division teams take part in the two-day matches at the ICC Academy in Dubai. And the two teams who reach the final will battle in a three-day final, for the first time, with the champions pocketing Dh100,000 and the runners-up Dh50,000. Many of UAE's international players including Khurram Khan and Swapnil Patil will be playing for their domestic sides in the competition sanctioned by the Emirates Cricket Board (ECB), and Sajan insists it can only be good for the game. "The aim of the series is about knowing the temperament of a player which you cannot learn in Twenty20 which is generally played more often in the UAE," said Sajan. "It will give them the exposure of two and three-day cricket and learning how to improve their batting and the required skills to bat for a longer period. Even in a 50-over game, teams get bowled out for inside the 50 overs and so by giving them the exposure for two-day and three-day cricket, it will build their temperament – mentally and physically. Explaining the reason on changing the final to a three-day encounter, Sajan added: "In two days, it's not possible to complete two innings but in three days, it's possible to get a full outcome of the match." With the UAE acquiring ODI status earlier this year thanks to the popularity of the shorter format in the country, Sajan acknowledges it will take some time to see the national players in white shirts. He said: "Test status for the UAE is still very far away if I'm honest, but the series can develop the players and help them adapt to Tests because it's not an easy format to play – it requires patience and concentration."